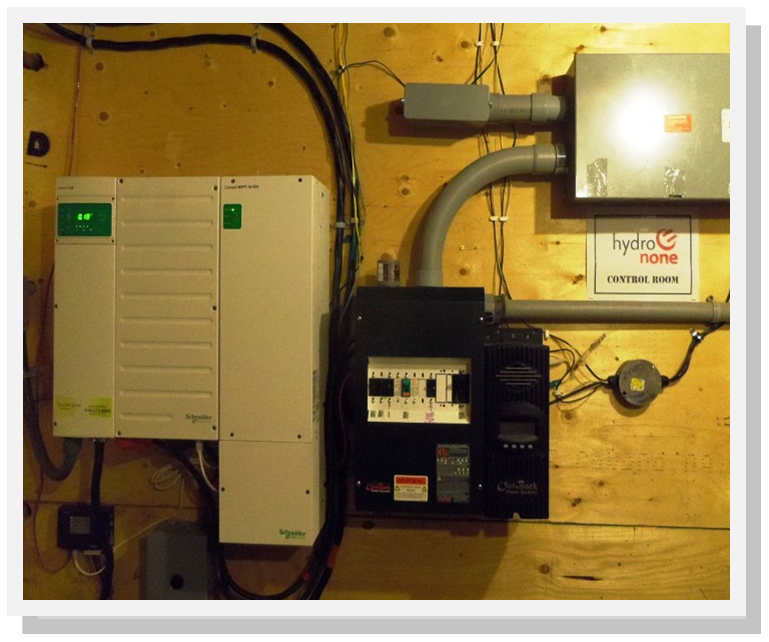 For guests interested enough (or foolish enough haha) to ask me for a tour of how the off-grid system works, we start at the solar panels outside and eventually end up in the basement looking at a large battery bank and the electronics that keep it all humming smoothly. Along the way I explain how energy from renewable sources is generated, stored, and converted to usable house current. I also tell them a bit about off-grid living, and how it’s not just about being independent or not having an electricity bill. It is about living as sustainably as possible… reducing carbon footprint and continually looking for ways to make most efficient use of electricity as well as finding ways to use this renewable energy to replace non-renewable sources. Otherwise “off-grid” is just a clever collection of electronics with a dubious halo. So, if their eyes have not yet fully glazed over, I explain some strategies like using an induction (electrical) cooktop or toaster over instead of the propane stove on bright days. I have also been gradually amassing a collection of electric and battery-powered yard tools. So far, there is an electric log splitter (thank you, sun, for saving my back and shoulders from ruin splitting elm! ), as well as a line trimmer, hedge trimmer, brush cutter, and chainsaw. Battery-powered saw easily cuts through even dense hardwoods. 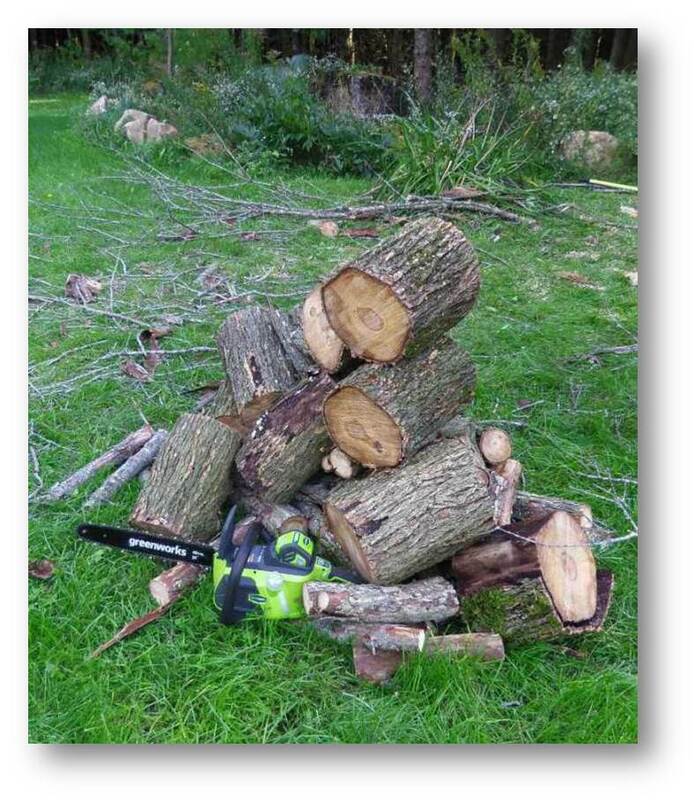 Now, if you’re a die-hard woodsman or woodswoman, don’t laugh too hard at the idea of a battery-powered chainsaw. I do have gas-powered Stihl 250 for really heavy work, but I use the battery saw for about 90% of my cutting! The technology has come a long way in the past 5 years, much owing to better batteries, higher voltages, and brushless electric motors with good torque. The portable tools all use the same type of battery so I have lots of run time with multiple batteries. A couple weeks ago, the magical combination of end-of-season clear out and a 20x points day coalesced at Canadian Tire and out I walked with a new tool in the arsenal. This 40V (same battery as the other tools!) lawn mower is the latest way to trim my carbon footprint here a little bit more—and make life a just a little bit healthier too! It’s a useful and ingenious piece of technology. 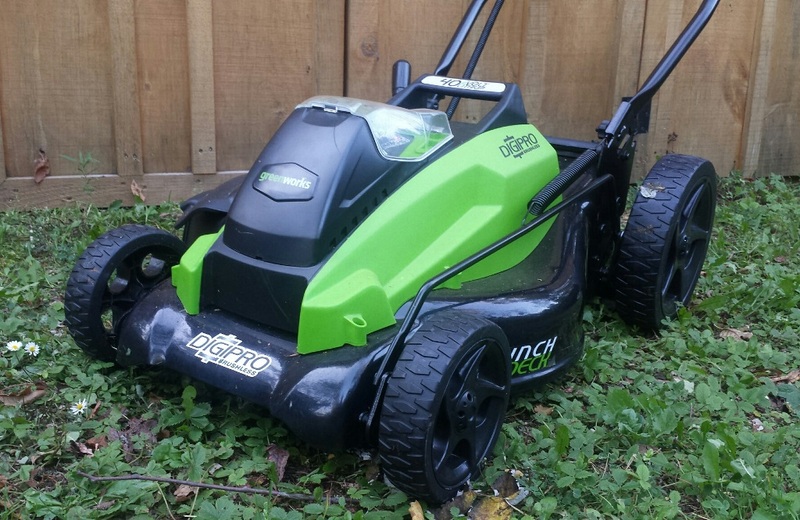 Like the chainsaw, it has a brushless motor; it senses load requirements and speeds up when mowing thick or heavy grass and spinning more gently for lighter cutting… which saves power and gives longer run time. I was surprised by how much got done on one battery. With the extra batteries from the other tools on hand, it is essentially limitless. There are still times and places I will use the gasoline-powered lawn tractor, but the new mower does a better job and is a lot more pleasant (and healthy!) to use… plus it is easier to see little froggies in the grass and scoot them out of harm’s way 🙂 An added bonus is being able take it to more remote trail areas on the property where the tractor cannot access and, until now, I had been maintaining them with a line trimmer. That will save a lot of time and help make it easier to keep the trails well-kept for guests. If you’re interested in more than a brief tour of the off-grid system I also do a half-day learning session, available to overnight airbnb guests as well anyone who wants to make a day visit just for that purpose.